American choreographer, artist and director Kevin O'Connor on ensemble aerial, Axis Syllabus, contemporary circus in the USA, and the inspirational movement of gibbons. I grew up in a commune in London, Ontario and was immersed in improvised dance training and visual arts from a young age. After high school I completed a Science degree in Natural Resource Conservation at the University of British Columbia, where I studied wild salmon populations, mountain lions, and worked on land use plans. In Vancouver I developed a rigorous ashtanga yoga and capoeira practice. After graduating I decided to pursue my artistic interests full-time. I was keen on exploring and researching body knowledge through practice as opposed to academic work, and moved to London, England to train at Circus Space. I developed a trapeze piece there and then auditioned for the École nationale de cirque in Montreal, got in, and specialised in corde lisse and minored in clown there. After graduating I moved to New York and immersed myself in the city, working for a site-specific dance company called Sens Productions and teaching a lot of corde lisse classes. I watched a lot of performance art, became involved in the contact improvisation world, went to shows in the downtown dance scene, and performed in the nightclubs. I produced my first installation piece with seven aerialists in a small warehouse space in Brooklyn. After that I started to receive funding from the Canada and Ontario Arts Councils and produced The Sunlight Zone, a full-length show which toured to California and Ontario. I currently live in Oakland, California. There’s a great dance and circus community, and many circus artists here are also interested in performance art, dance, contact improvisation... I’m particularly inspired by the work of Keith Hennessy — originally from Canada and now based in the Bay Area with his company Circo Zero. His work is both political and queer. It was in London that I first started my studies of the Axis Syllabus with the teacher and dancer Frey Faust. The objective of the Axis Syllabus is to propose a practical method for instilling safe reflexes and logical responses to the problems of moving. Essentially it’s a research platform for the study of applied biomechanics. The knowledge gained from AS allowed me to respect the structural integrity of the body while moving, and when I went to the National Circus School in Montreal, Axis Syllabus provided me with an invaluable tool for self-defence during the rigorous pedagogical process of the circus school environment. I was always questioning the value of holding extended hyper-flexible positions while on aerial apparatuses, and I became much more interested in transitions between rest points and the harnessing of gravity as I moved through the vertical sphere. Axis Syllabus also greatly influenced my interest in finding ways to link the vertical sphere to the horizontal sphere through movement. On a practical level I used to be frequently injured and now for the most part I’m injury free. 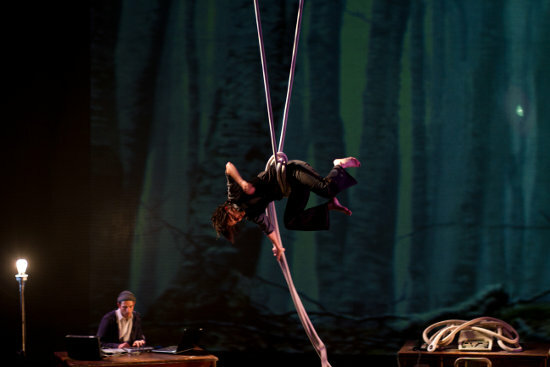 My piece Habitat, performed by six aerialists on six ropes, was inspired by watching videos of gibbons in their arboreal home swinging gracefully and efficiently in the forest canopy. Their natural locomotion evolved in relation to their environment. I’m currently doing an MFA in choreography and through that became reacquainted with the computer lab, where students spend countless hours sitting and staring into a computer screen. Habitat examines the effect of our built habitats on our movement. I was questioning how our built environments (in this age of digital technology), constructed solely for human use, dictate the movement of the body. As we become more dependant on technology do our movement patterns become smaller and smaller? Most of the artists in Habitat had trained with me in rope for a number of years. In many ways the piece was an accumulation of the training we had done together. Each of the artists was interested in exploring movement from the horizontal to the vertical sphere, partnering on the rope, and focusing on how gravity influenced the body in space. We spent a couple years really playing with how to harness gravity. We worked with using the fall of a limb, or harnessing the energy of the fall to move somewhere else. At one point we trained at a friend’s house off of a tree, swinging off a fence from one rope to another. Then we found a studio where we could hang eight ropes in a row and just practice the idea of ‘walking’ while swinging. Research has shown many biomechanical similarities between brachiation (swinging from one hold to another in trees) and walking. We all developed powerful one-arm grips. Habitat came together in three weeks. We watched YouTube videos of gibbons. We created patterns we played with on the ropes. I set an improvised score for the movement of the set and the way we interacted with the set as a whole. Often in creating longer, group aerial pieces it’s important that each individual artist has moments of rest and moments of being on the ropes. The arms get burnt out and so it’s important to incorporate rest movements in each individual pathway. I designed a set that we worked within, and collaborated with Homunculus Rex, a two-man digital/live glitch acoustic music experiment based in Santa Cruz. I’m interested in aerial as a component of larger creative projects. At the National Circus School in Montreal there was so much focus on developing a five-minute solo which you make over three years so you can sell it and tour it. That structure didn’t allow me to play and be creative within the vertical realm. Working with larger casts and multiple hanging points allows me to explore the possibilities of moving in space from the vertical to the horizontal, via all the points in-between. It allows the work to not focus on the individual tricks but instead on the use of space and transitions between fixed places. I’ve been working on different solos lately but much prefer collaborating with different artists when creating work. Often my interest starts with researching an idea. I rarely start with a story or anything literal. Right now I am examining the idea of a body as a place, the porousness of places, the body as a pack not a singularity, and the ecological body. I’m always researching and playing with technique as a daily practice. However, I always need to find a connection between the practice and the idea or theme I am researching. This connection is what makes me work and I struggle with it a lot. Habitat was based on a lot of playing with and creating within a certain technique. However, the technique did not drive the choices made. I always tried to return to the idea. I took a set design class and had to create a set for Habitat before I had created any of the work. I never usually work this way and took it as a challenge to more or less start with a fixed set and then work within it. The heap of old junk — computers and bits of different computer labs — went from a chaotic pile to something organised. That is what I was researching: the human desire to organise chaos. This was overlaid with the ape-like movement on the ropes. There is absolutely nothing linear about it. It’s a mix between circus, an installation and a performance art piece, with most of it being improvised. I think more and more I am interested in performance art, a term which can encompass circus and dance, visual art and installation. I think all practices are important and useful. What I am questioning is not why I use the dance or circus technique but how it relates to whatever I am exploring or researching. A big difference in terms of training is the amount of time a circus artist spends perfecting one trick or working on one number. For a movement artist the focus is often not on one trick but on the transitions between places or moments. Many aerialists forget about their connection to the floor. Without training on the floor the most graceful person in the air can look awkward on the floor. Being hyper-mobile is often useful for poses and balances but often isn’t very useful for dynamic movement on the floor. There is hardly any support for making contemporary circus in America. If people get funding they receive it through their reputation as performance artists or choreographers. I also work on pieces with a collaborator, Ruth Douthwright, in Canada. It is much easier to get funding for contemporary circus work in Canada. We have an ongoing project working in different watersheds there: using different scores we create a site-enhancing piece, often on lakes or along rivers, that depends on audience participation to activate the place. I’m currently working on a new piece called dis/connect. It’s being made with three other, amazing aerialists in North America (Emily Leap, Laura Stokes and Cohdi Harrell) and performance artist Jorge de Hoyos Jr. I’m also working with three singers who improvise together and with the audience to create a soundscape. This piece explores the idea of place: not fixed entities, but porous places. Places as processes, and the body, like a building, as a kind of place. Based in California’s Bay Area, Kevin O’Connor is a director, teacher, choreographer and performer whose previous shows Dark Matter, Habitat and The Sunlight Zone have been performed in the US and Canada. He is currently undertaking an MFA in choreography at UC Davis. Kevin O’Connor was interviewed by John Ellingsworth January 2012.